Venezuela's President Hugo Chavez is meeting officials from 13 Caribbean nations to agree terms for supplying them with cheap oil. The talks in Montego Bay, Jamaica, will put the finishing touches to Mr Chavez's Petrocaribe initiative, which was launched in June. Venezuela is the world's fifth largest oil exporter, producing 3.1 million barrels a day. 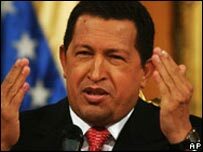 Mr Chavez denies using oil to secure political influence in the Caribbean. Venezuela's Energy Minister Rafael Ramirez said one of the ideas under discussion at the meeting was the creation of a joint venture between the Venezuelan state oil company and energy firms from the Caribbean. The talks are being attended by representatives of Antigua and Barbuda, the Bahamas, Belize, Cuba, Dominica, the Dominican Republic, Grenada, Guyana, Jamaica, Surinam, St Lucia, St Kitts and Nevis and St Vincent and the Grenadines. Two countries - Barbados and Trinidad and Tobago - have declined to join the agreement at present. Mr Chavez announced the Petrocaribe plan in June at a regional summit in Venezuela's city of Puerto La Cruz. He said the region had suffered centuries of imperialism and needed to strike out on its own. Venezuela is a leading oil supplier to the US, but Mr Chavez is seeking to develop diversified energy ties with the Caribbean, Latin America and Asia. The Petrocaribe initiative aims to reduce the prices Caribbean nations pay for oil imports. Venezuela already gives preferential treatment to communist Cuba and other nations. Venezuela's state oil firm PDVSA has created an affiliate, PDV Caribe, to implement the initiative. Mr Chavez has pledged highly preferential oil prices, with Caracas picking up 40% of the cost if oil is selling at more than $50 a barrel, as it is now. 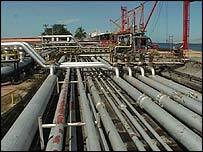 He has promised further concessions to the Petrocaribe signatories if prices hit the $100 a barrel mark. Venezuela is putting $50m into a fund to kick-start the plan, and Mr Chavez has said Caracas will pay for oil shipments and help with setting up storage facilities across the region. But he has insisted all this new business must be between governments, saying that the region could not hand any more natural resources over to Texaco and other private companies.